Steve Fullmer | "I made the decision years ago that the most intimate objects we live with are the vessels we eat and drink from, and have slowly collected bowls, cups and a beloved tea pot made by Steve… which I use and enjoy every day. Thank you." An artist in every sense of the word, Steve Fullmer believes in creating pieces of strong character, he has become a master of unexpected associations. American born living in Tasman, his environment generates an abundance of ideas. Steve Fullmer was born in Portland, Oregon, U.S.A. in 1946 and raised in Southern California near Los Angeles. It was here that his taste for arts and crafts was developed, first in the field of musical instruments making National Steel Guitars where quality was very important, and later discovering clay. Steve first arrived in New Zealand in 1973 and began production-throwing work in Auckland. Two years later he travelled around Australia and for a while worked as a production thrower for Courtland Pottery in Perth. Now settled near Nelson in New Zealand, he has established a pottery and gallery and fires his work in large wood-fired kilns. Steve, in this interview ( http://hrncirna.cz/en/galery_guest_fullmer_1.html ) you mentioned hand-potting at Beach Artware in 1973 and 1974 alongside, amongst others, Daniel Steenstra. At the New Zealand Pottery website ( newzealandpottery.forumotion.net ) we are starting to get a handle on unmarked pieces we believe to be from Beach, which after the death of Peter Beach continued trading as Traditional NZ, Kiln Craft, and finally Clay Craft, producing primarily slipcast wares. Any further information you can provide would be very helpful. Val Monk, author of books on Crown Lynn pottery, has started a topic on Beach Artware hand-potted here: http://newzealandpottery.forumotion.net/t5604-for-gallery-handpotted-beach-artware#21458 . Along with anything else you think may be helpful could you please tell us (1) who else was potting at Beach at the time, (2) was Beach Artware also making slip wares when you were there, and (3) did the individual potters have enough latitude in their work that it would be possible to distinguish the work of one from another, for example overall shapes, shapes of details such as knobs, and surface treatments (etc, etc). If nothing else it would be much appreciated if you could confirm that the unmarked pieces identified so far actually are from Beach Artware. Thanking you in advance, Jeremy Ashford. My name is Drew Harré I’m a NZer but have lived in Paris for the last 40 years. When I come back to Auckland every year I stop into the Poi room in Newmarket and buy a piece of your pottery. I missed a large salad bowl last time and asked this time if they had another, but no. Is there any where else you sell in Auckland or France or a website where I could order ? Hi Steve. I have bought a lot of your work which I love. I am currently living in Perth WA. I would like to purchase a couple of your ‘Blue Whale’ broad rimmed mugs. Can I do that and what will be the costs to have them sent here to Perth. Steve, am trying to reach Douglas Fullmer – is he still in the US? We have many of his works which we purchased in 1997 when we met Douglas in Carefree, AZ. Any chance we can get his email address from you? Let him know we have 2 Hopi Women, church, 4 spirit sticks and wall spirit doll of his works. Thank you so much and hope you’re enjoying your life abroad – sounds so interesting to read about you and your accomplishments! I made the decision years ago that the most intimate objects we live with are the vessels we eat and drink from, and have slowly collected bowls, cups and a beloved tea pot made by Steve… which I use and enjoy every day. Thank you. 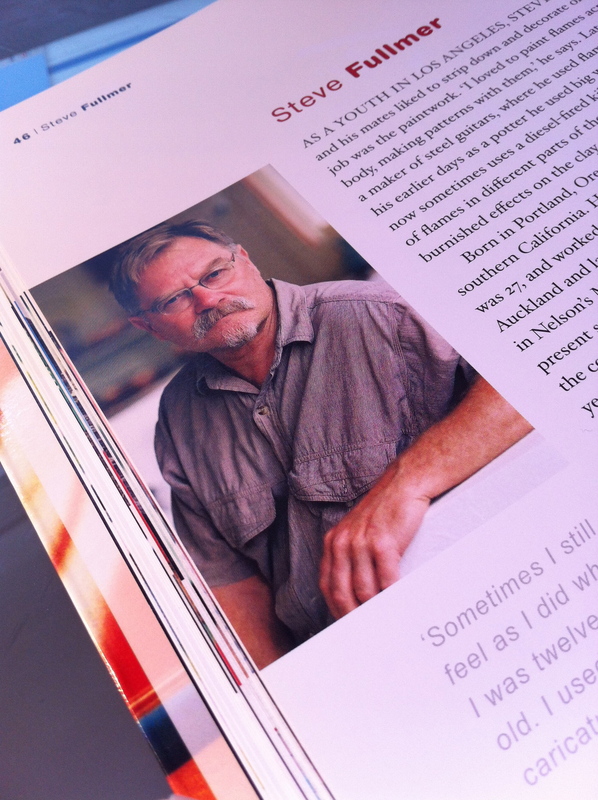 My first (virtual) encounter with Steve Fullmer was in 1992 – the image of a young man in front of a wood-fired kiln, cradling a large earthenware flamed and scorched vessel in Maurice Shadbolt’s 1988 “Reader’s Guide to New Zealand”. The simplicity and intensity of the piece captivated me and my fascination with Steve’s work continues to this day. We later met at his studio in Tasman and started what has developed into a significant collection of his body of work, initially his quirky domestic ware and progressing over time to larger pieces of sculptural work. Over time, we’ve enriched the collections of friends in Germany and elsewhere – many of them potters – with gifts of Steve’s work to the extent that children of German potters refuse to eat their breakfast off anything but “Steve’s Teller” (Steve’s bowl). My epiphanal experience, however, was an image of “Angel” in the August 1995 issue of “North and South” which made its way to my office in Frankfurt, Germany. A deja vu experience of our 1992 encounter, I immediately called Steve – probably at stupid o’clock in the morning – and bought it sight unseen, not even asking the price. I collected it a year later and transported it – with the assistance of its image in Naomi O’Connor’s “A brief guide to New Zealand Art and Culture” – strapped into a empty seat on a flight to Wellington, occupying the forward lavatory (suddenly “Out of Order”, to the chagrin of Business Class passengers..) to Auckland and – thanks to the heroic efforts of United’s ground staff – in the largest overhead bin to Los Angeles. This is the power of Steve’s work, be it a plate, a Mudfish, a Reefhead, a Pilot vessel or a sculpture. His work is instantly recognisable as significant and special, whether by practitioners, collectors or guests at our table. Steve has remained grounded in the rich traditions and mythology of both his birth country and Aotearoa. I can think of no greater accolade. I’m in Christchurch for a conference in July. I’m a ceramics artist from Adelaide. I’m looking to participate in a ceramic work shop whilst in NZ. Are you running any workshops in late June or early July or do you know of other ceramic artists I might contact please?